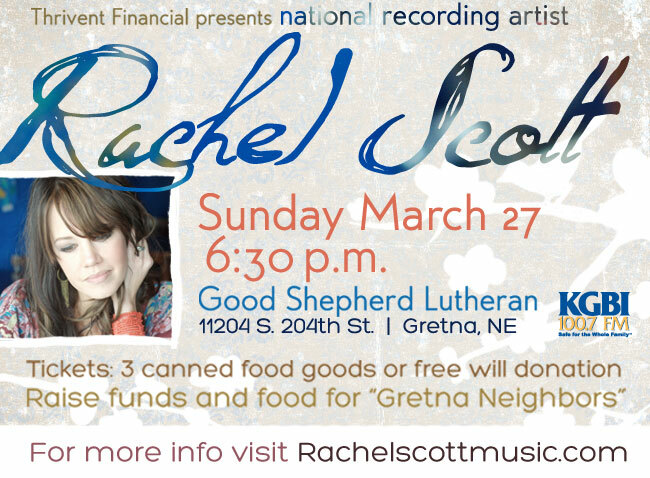 March 27, 2011 – Rachel will be in concert at Good Shepherd Lutheran Church. Doors open at 6pm. Starts at 6:30pm. Don’t miss it. the purpose for the event, is to raise money and food for “Gretna Neighbors” a local ministry that helps people in need. Thrivent Financial has funded the event. Come participate in worship, and song as Rachel shares her live and music with those attending. Rachel Scott is continually in partnership with KGBI 100.7fm. Request to her her music if you live near the Omaha area. Tickets: 3 cans of food per person.